The No. 4 Ohio State Buckeyes stepped out to the mats draped in robes on Friday at the Schottenstein Center, but they weren’t able to get comfortable against the No. 2 Nittany Lions, eventually losing 32-12. OSU only managed three wins in 10 bouts. 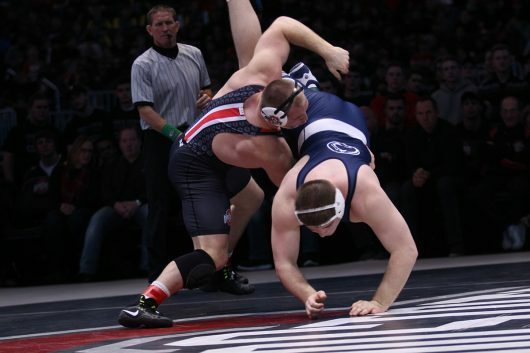 One of those victories was junior Kyle Snyder in the heavyweight division. The Olympic gold medal winner dominated No. 3 Nick Nevills 19-9. That was the highlight for the Buckeyes. Penn State began its dominance early starting with second-ranked Nick Suriano. OSU redshirt freshman Jose Rodriguez had little answer for Suriano, losing via technical fall at 125 pounds. No. 1 133-pounder redshirt junior Nathan Tomasello captured a technical fall of his own to even the team score 5-5, but it was the closest the Buckeyes would come to the upset. Penn State proceeded to go on a six-match win streak, driving the score up to 32-5 before OSU redshirt freshman Kollin Moore captured a victory at 197 pounds. 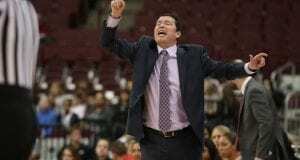 The Buckeyes were mathematically eliminated from a shot at a victory before the 184-pound matchup began. At 149 pounds, No. 5 Micah Jordan (OSU) was pitted against No. 1 Zain Retherford, and dropped the matchup with a 20-5 technical fall. Jordan has faced top-three opponents each of the last two weeks. The Buckeyes trotted out backups at 157 and 174 pounds. Penn State had a top-10 wrestler in each of those classes and showed it by pinning their OSU counterparts at each of those weights. At 184 pounds, there was a rematch from the 2016 National Championships between sophomores Myles Martin and Bo Nickal. While Martin won the National Championship for OSU, Nickal got the better of him in this matchup, winning by decision 8-2. Fourth-ranked 197-pounder Kollin Moore continued to cement himself as one of the elite wrestlers in his weight class with a 9-6 decision victory over No. 9 Matt McCutcheon (PSU). 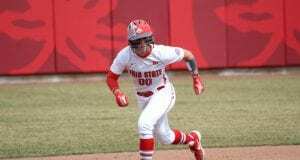 On the night, the Buckeyes finished with three victories in 10 matchups, and they’re second consecutive team loss. There were no upset victories on the night, as every match was won by the wrestler who was ranked higher. At 174 pounds, Bo Jordan was out after aggravating a foot injury last week against Iowa, Ryan said in the post-match press conference. On another note, American wrestlers were banned from participating in the Iranian World Cup, which included Snyder and former Buckeye great, and four-time NCAA champion, Logan Stieber. Snyder and Stieber were set to wrestle in the tournament Feb. 16-17 before receiving news that they were not allowed to travel to Iran. OSU’s next match comes against another top opponent in No. 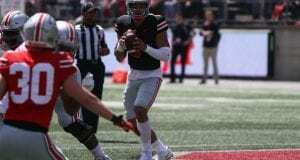 13 Rutgers on Monday in Columbus.